Nigeria recovered from a sluggish start of their 2019 Africa Cup of Nations qualifiers campagin after crushing Seychelles 3-0 at their home pitch in Victoria on Saturday. 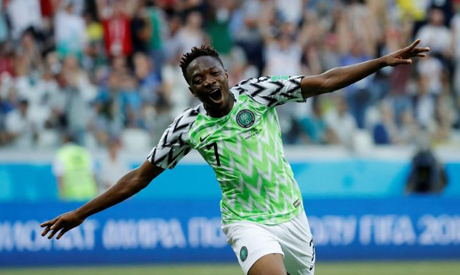 The Super Eagles, who were bottom of the group E following a first round defeat to South Africa 2-0, have edged their hosts courtesy to goals from Ahmed Musa, 15, Chidozie Awaziem, 34, and Odion Ighalo in the 54th minute from the spot. However the two-time African Champions remain third of the group one point behind co-leaders South Africa and Libya who drew 0-0 in Durban. In Group B, Cameroon were held to a 1-1 draw by Comoros, giving a disappointing start to new Dutch coach Clarence Seedorf. The former Dutch midfielder, who was appointed in August, failed to impress in his first test against the 149th nation in the FIFA ranking. El Fardou Ben Mohamed opened the scoring for the hosts in the 15th minute, and the Indomitable Lions had to wait until the 80th minute to get the equalizer through Stephane Bahoken. However, Cameroon, the 2017 African Champions, are not under threat as they have already qualified for the next edition as hosts. Ghana have complicated the outcome in Group E after losing to Kenya 1-0 in Nairobi. The Black Stars fell behind to an own goal from Nicholas Opoku in the 39th minute, and failed to get anything out of this game though the Kenyans had to play with only 10 men on the pitch for 30 minutes following the expulsion of Joash Onyango. Ghana, Kenya, Sierra Leone all have three points now, with Sierra Leon due to play Ethiopia on Sunday.